PLOT SUMMARY: In the pre-credits sequence, journalist Tom Hammserschmidt (Boris McGiver) and press secretary Seth Grayson (Derek Cecil) debate the impact of ex President Walker's testimony to Congress. 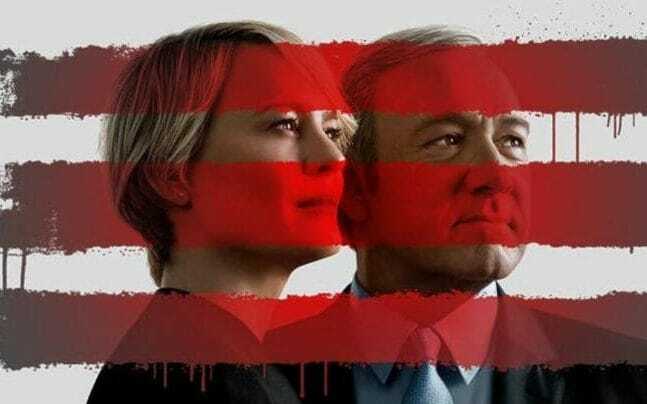 Hammerschmidt claims that President and Vice President Underwood (Kevin Spacey and Robin Wright) are close to impeachment. After the credits we see Secretary of State Cathy Durant discussing immunity with her lawyer over lunch before being joined by Jane Davies (Patricia Clarkson). Jane makes overtures and asks Cathy if Claire could survive and become President. Meanwhile the Underwoods decide to attack Walker's credibility. But the stress causes Frank to lash out at Claire who has more chance of survival. Radically, she then breaks the fourth wall for the first time in the series and explains that she knew the audience was there the whole time but feels ambivalent about it. The Underwoods then tell Usher that Frank is willing to accept Censure. Claire also tells Usher that she won't stay out of it, but will support Frank. Claire asks her lover Tom Yates (Paul Sparks) to leave the White House. Frank's creepy ex-personal trainer Eric declares his love for Frank. Alex Romero tells the Underwoods special adviser Mark Usher (Campbell Scott) that he has become an Independent and is now sitting on the Congressional Committee investigating Frank. Meanwhile, ex campaign manager Leann Harvey (Neve Campbell) enquires as to whether Aidan McAllan (Damian Young)'s death was suicide or murder. Chief of Staff Doug Stamper (Michael Kelly) discovers that it's Seth Grayson who's leaking against Frank and that Cathy Durant is loyal. He also discovers that McAllan left something for Harvey. Stamper reveals to Claire that Frank had him follow Tom. In response she warns him off seeing Laura Moretti, the woman he has been sleeping with. Stamper then tells Moretti he's the reason her husband was killed. But Moretti is sanguine about the news. Stamper then goes to Leann Harvey's house to tell her he's been watching her. She seduces him. We realise that Frank is watching through Leann's laptop cam. We, and Hammerschmidt, learn that although seemingly loyal, Cathy Durant will testify against the Underwoods. Moreover, he is sent an anonymous thumb drive - perhaps from McAllan? Finally, Stamper and Frank share their concerns about Claire's loyalty. COMMENTS: The shifting power is indicated by Claire breaking the fourth wall. I'm still ambivalent about this. I also feel that the odds are so stacked against the Underwoods that it would be incredible for them to survive.